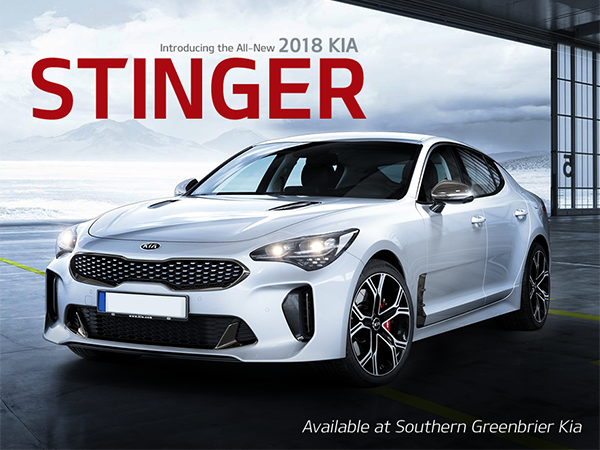 The 2018 Stinger GT is available at Southern Greenbrier Kia and its eye-catching design is a sight you must see. The all-new version of Kia's grand touring concept car comes to life in the Stinger GT, complete with all-wheel drive, premium amenities, and head-turning design. The amazing Stinger is more than just a fast sports sedan, it is Kia redefined. The 2018 Kia Stinger won two top awards at the North American International Auto Show; Best in Show, for sports sedans, and it also merited the EyesOn Design award for Production Car Design Excellence. You won't need a note from your cardiologist, but, rest assured, the 2018 Stinger GT will make your heart pump faster with its performance. With the new Stinger, you have the choice of two turbo-charged engines. And, these are matched with an 8-speed automatic transmission with five driving modes. You said you wanted power and Kia heard you! What do you say about a sports sedan that offers a powerful drivetrain, delivers a heart-pounding performance, is fuel efficient and provides a premium sports car feel? How about, "I'll take one, please." A powerful 2.0-L turbocharged four cylinder engine producing 255 hp and 260 pounds per feet of torque. Or, an even more powerful 3.3-L twin-turbo V6 engine producing 365 hp and 376 pounds per feet of torque. A second-generation 8-speed automatic transmission utilizing five drive modes. Vented disc brakes with quad-piston front calipers and dual-piston calipers in the rear. The 2018 Kia Stinger GT offers an interior that is sleek and striking. We would exhaust a thesaurus trying to describe the level of sophistication you will find inside this amazing sports sedan. The Stinger offers undeniable comfort, the latest driver-assist technology, and the ultimate in infotainment. Step inside and let the pampering begin. Don't delay! Visit us at Southern Greenbrier Kia today as the 2018 Kia Stinger GT will be offered in select markets with limited availability. You better hurry and get yours today.